Bridge 90990 is a single-span, stone-arch bridge constructed in 1908. 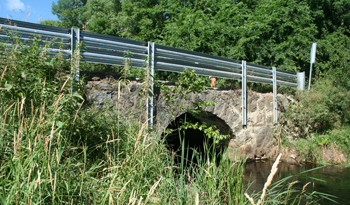 It carries 273rd Street (Township Road 161) over Washington Creek approximately 4 miles north of Dassell in Meeker County. Both the structural arch and the headwalls/wingwalls are comprised of locally-sourced granite fieldstone. Bridge 90990 is significant for its design and construction as a county masonry-arch highway bridge. Design and construction of a masonry-arch country highway bridge comprised of random coursed granite fieldstone. 1908 carved granite datestone on the south spandrel wall.